Earlier this season I was skiing boilerplate and caught an edge. As I started to fall toward a tree hole in front of me, I felt that pain that no backcountry skier wants to feel. A sharp pain in my tib / fib. While falling the thought of a long toboggan ride to the first aid room began to fill my head. But just as I was about to hit the snow I heard the pop of the Diamir Fritschi Vipec 12 toe pieces and I ejected from both of my skis. I rose with a sore shin but was able to step back into my bindings and carry on. This really confirms why I like these bindings, toe fumble and all. 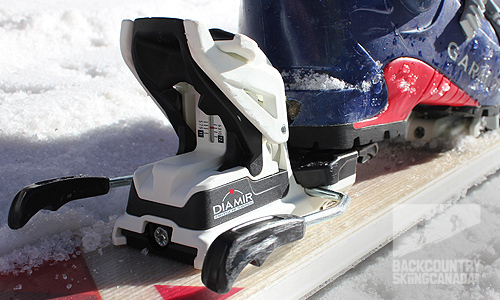 The Diamir Vipec 12 is the first tech binding from the maker of the popular Freeride AT frame bindings. These bindings set the standard for alpine touring (AT) bindings a few years back but now since tech bindings are king, we are seeing lots of manufactures entering this space. The Vipec has been on the market for a couple of seasons now, but in 2014/15 some significant upgrades were introduced. The first change is that the adjustment pin in the toe piece which controls the locking mechanism has been upgraded from an M5 thread to larger M6 thread. This helps provide for better locking with different boot shapes and sizes and prevents the pins from threading out. New larger M6 threaded pins for 2014/15. The second upgrade on the 2014/15 Vipec is the addition of a spring-loaded locking pin. This locking pin is a wire yoke that fits over the binding wing arm and prevents the pin from rotating. Again helping with the thread out problems. New keeper wire to help prevent pin loosening. The third upgrade is a new compression spring that disengages the pins from the boot with a higher power allowing the user to remove the binding more easily. Several early users complained that the first generation Vipec Bindings felt a little ‘sticky’ to disengage from. This new compression spring has been redesigned from an axle based spring to a horizontal spring which is also located higher on the wing. The fourth upgrade and in my mind the most beneficial is a new and improved toe guide which helps align the toe of your boot and facilitates getting into the Vipec toe piece. The toe springs also have an increased horizontal opening distance which provides more room for your boots when entering and exiting the Vipec. While aligning the toe tech pins is still some what challenging, with practice I have been able to reduce the aborted entries to a minimum. Also, placing your heel into the Vipec first and then stepping into the toe piece second seems to help the odds. New black toe glides to help with tech toe pin alignment. 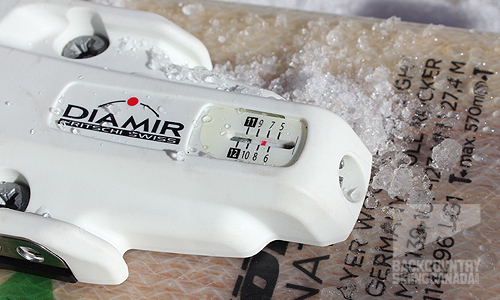 The Diamir Fritschi Vipec has some great features from the first generation which naturally have been brought forward in the 2014/15 version. With most tech binding you in order to switch from ski to tour mode you need to step completely out of the binding, however with the Diamir Fritschi Vipec's you simply push down on the tab at the back of the heel piece and the entire heel unit slides backwards and out of the way. You are now in tour mode, it’s that simple. The G3 Onyx bindings offered up this super handy feature and its equally useful on the Vipec Binding for traversing flat sections. 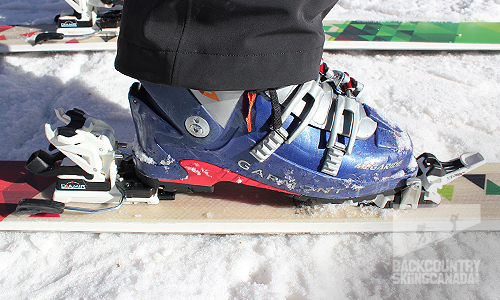 The heel piece slides back and out of the way for on the fly shift from ski mode to tour mode. The Diamir Fritschi Vipec weighs in at a respectable 1158 grams per pair with brakes so there is no chance of Dynafit weight envy. If you are heading out on a big ski traverse where every gram counts you have the option of leaving behind the ski brakes behind which will save you approximately 200 grams. This is a nice weight saving feature that’s not found on many of today's newer tech bindings. 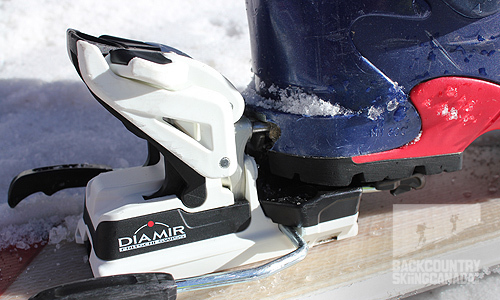 The Diamir Fritschi Vipec is still the lightest tech binding with a DIN releasable toe. A feature that cannot be understated. This means that you always have some form of toe release, even in tour mode. This is an added safety feature especially when ski touring uphill in avalanche terrain since having your skis release in a slide increases your odds of survival. The only drawback to this feature is that I did find when side hilling on icy terrain the binding could pre-release. 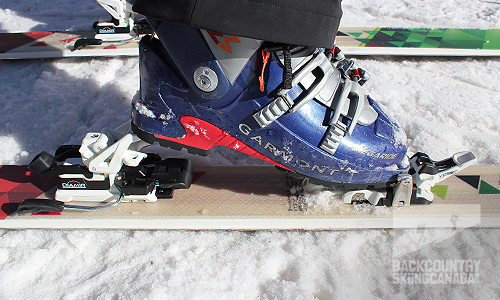 This however is just the trade off to a releasable toe piece and makes one tread more gingerly on icy side slopes. Since both the heel piece and the toe piece move on the Vipec Bindings your ski is free to flex similar to what you would experience with a traditional alpine binding. 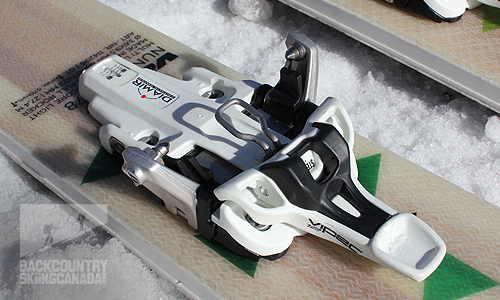 This eliminates the dead spot in your skis and makes the ski more responsive in variable and challenging conditions. Older tech binds were plagued with limited flex so they would occasionally pop out of ski mode while under stress and the skier would inevitable be surprised and hit the snow hard. 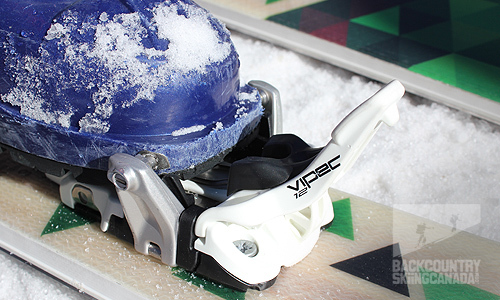 The Vipec Bindings help mitigate this problem with the sliding toe and heel piece which also provides constant contact between the boot and binding, even during aggressive skiing. The three position heel risers are unchanged from early versions of the Vipec Binding since they are simple to engage with the end of your ski pole and work effectively. 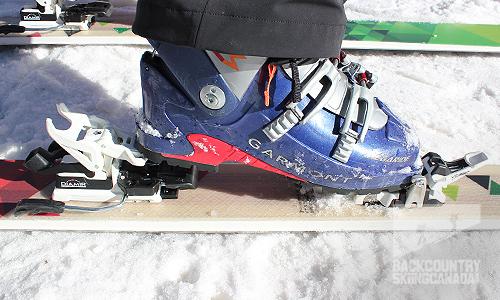 It’s hard to believe something so simple can be so complicated as it was with the G3 Onyx bindings. Not so with the Vipec Bindings, the 2°, 9° and 13° risers are well designed and easy to use. 2 degree heel riser position. 9 degree heel riser position. 13 degree heel riser position. 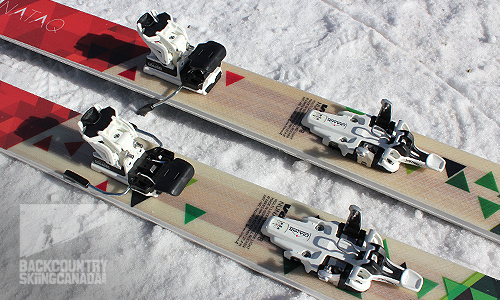 - Easy switch from tour to ski mode without stepping out of the binding. - Three level heel riser. - Micro adjustment width wings help with boot compatibility. - Integrated dynamic range in heel and toe ensures predictable release. - 5-12 DIN for both heel and toe. A closer look at the toe and heel pieces. Full 5-12 DIN lateral release toe piece. 5-12 DIN setting for the heel for great ski performance. After a full season skiing on the Diamir Fritschi Vipec Bindings I can honestly say “I love them”. They have never let me down in any snow conditions or terrain and have released when I needed them to without any pre-releases. Aligning my tech toe pins is still an issue for me on occasion but with practice it’s becoming less and less problematic. The DIN toe release instills confidence especially for skiing big lines and while putting in up-tracks in avalanche terrain. The ability of the heel to slide back and out of the way is a huge benefit for both compensating for natural ski flex and also facilitating a quick and easy switch from ski to tour mode. 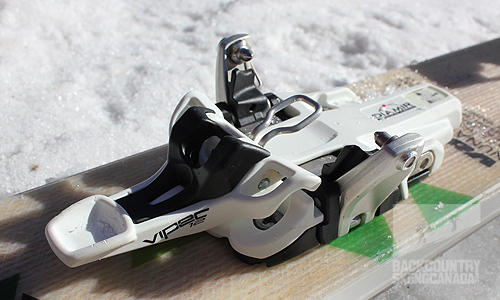 As more and more tech bindings come to maker with their increased popularity I would still place the Diamir Fritschi Vipec Bindings near the top of the pile and one that you should consider for your binding choice. 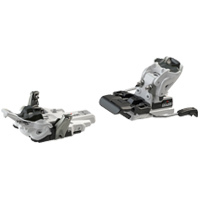 For reviews of a wide array of other frame and tech alpine touring bindings click on over here to our binding review page. - DIN release toe piece is unique in the tech binding world. 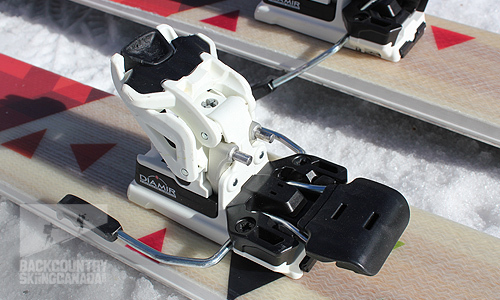 - Sliding heel plate so can switch from ski to tour mode on the fly. - Elasticity in the binding to prevent pre-release and accidental switch into tour mode. - Light weight with removable brakes. 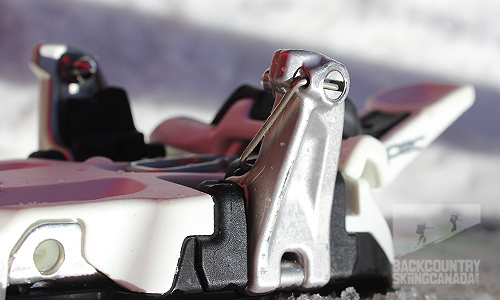 - Simple and Clean design for attachment of a ski crampons with two levels of crampon bite. - Easy to use heel lifters. -Challenging to align tech toe pins. - Occasional now build up under the heel piece. - Side hilling can be tricky due to the possibility of lateral toe release.